When Gerry Harper (’57) talks about his small raspberry farm that has been in the family since 1915, a smile spreads across his face. The twinkle in his eyes in unmistakable. Gerry truly loves what he does. 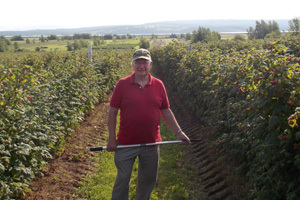 Gerry is the owner and operator of Harper’s U-Pick, one of the largest raspberry farms in Southeastern New Brunswick. 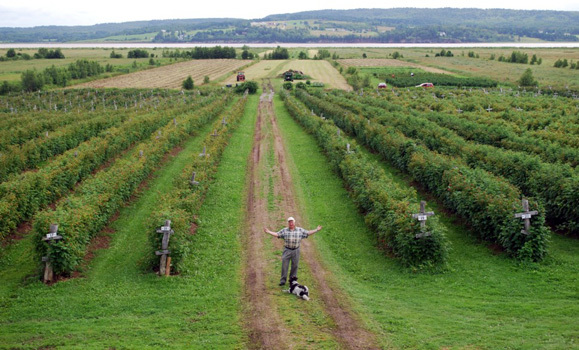 Located along the Petitcodiac River, Harper’s U-Pick proudly cultivates a variety of fruits for public picking. Although predominantly a raspberry U-pick, Harper’s offers gooseberries, elderberries, black currents, and more. 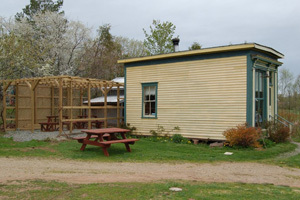 While the farm has changed dramatically over the years, it has been operating on the same area of land since 1915 when the Harper family moved there. 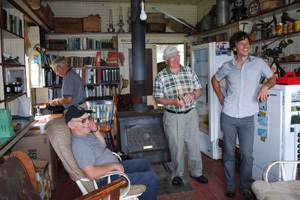 George Harper, Gerry’s grandfather, originally purchased part of the land where he operated a small farm market. He sold cucumbers, summer savory, and cabbage, which he processed to sauerkraut. Gerry took over the farm 18 years ago. Over the years, it has expanded and production has been steadily increasing. The greatest challenge, Gerry notes, was the high water levels on the property. The land sits on a number of natural springs which made farming the land difficulty. With careful planning and proper drainage installed, raspberries began to thrive. Although the farm today operates primarily as a U-pick, some berries are harvested and sold to wineries. Others are sold to vendors at the Farmer’s Market. The rest are left for picking. People from near and far enjoy the picking season at Harper's U-Pick. While the hobby farm hosts a variety of berries, it’s the experience that they offer to pickers that Harper’s U-Pick prides itself on. With a small store on the property decorated with interesting antiques, shaded picnic tables, a grapevine-covered gazebo, and multiple beds of beautifully kept flowers, Harper’s U-Pick ensures that their property brings a smile to the faces of those who visit. Harper’s U-Pick is Gerry’s pride and joy, although it was not always his primary career. After earning a diploma in engineering at NSAC in 1957, Gerry worked for Farm Credit Canada for 30 years as the district manager for NB and NL. His farm was simply a pastime. Now well into his retirement, Gerry works on the farm full time, not to make a living but simply because he enjoys it. It’s not just the pickers though who Gerry considers family. Gerry operates Harper’s U-Pick alongside his good friend Frank. Frank, also retired, has become a staple on the farm overseeing the store, the scales, and helping out where her can. During the summer in peak season, Gerry will hire one other employee to help out around the farm. During the off season, while there are no plants to tend to, Gerry admits there is still lots to do. Looking towards the future of the U-Pick, Gerry admits he isn’t sure what will happen. His kids are not directly involved with the small hobby farm and Gerry isn’t exactly sold on the idea of selling the farm. For now though, pickers can look forward to visiting Harper’s U-Pick during the summer months. Plants have been ordered for next year and Gerry looks forward to seeing the returning pickers and hopefully some new faces. Along with his passion for his small family hobby farm, it’s all part of what makes Gerry’s job so enjoyable.